Kurt Schmidt, Lindcove Research and Extension Center (LREC) Superintendent and Elizabeth Fichtner, Farm Advisor, UCCE Tulare County, video-conferenced with the second grade classes of Mrs. Stella Guiry and Mrs. Jennifer Solano at Stewart School in Garden City, New York. The outreach program was organized by Ms. Dawn Ripp, the Stewart School librarian. Using remote conferencing technology, Elizabeth presented a PowerPoint presentation to the students, highlighting the importance of science and technology for agricultural productivity, economic and environmental sustainability, and the maintenance of a healthy and safe food supply. Students then addressed Kurt Schmidt with questions regarding his experiences as a citrus grower, from protecting trees from the cold to production of seedless varieties. The outreach program was timed in conjunction with students planting a school garden and making mini-greenhouses out of recycled materials. Kurt Schmidt and Elizabeth Fichtner answer questions posed by elementary school students at Stewart School in Garden City, NY. 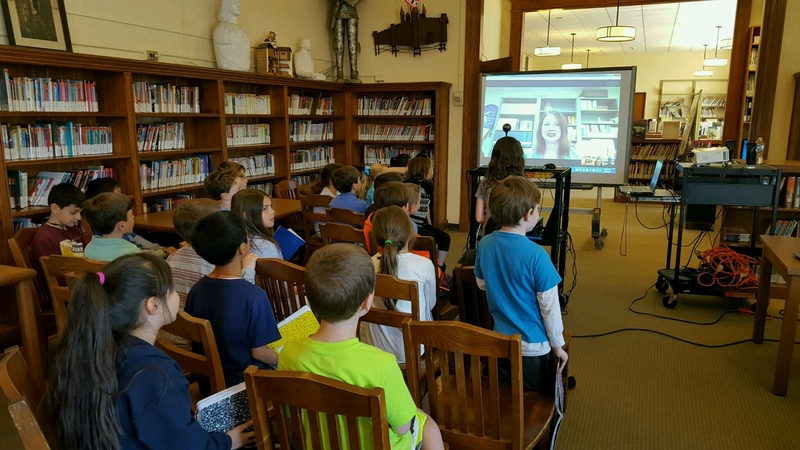 Students congregated in the school library for a video conference with Elizabeth Fichtner. Our students LOVED your presentation. Having our students speak to experts in their field was priceless! The STEAM project they are working on was brought to an even higher level by you sharing your knowledge. Thank you for taking time out of your busy day. We were very happy to share a piece of California agriculture with the children. Fantastic way to reach students and teach them about California Agriculture. Thank you both!